Rain fell today. We had 27ml of steady rain, not the sudden over-in-a-minute kind, but the sort that sinks into the garden and refreshes. It was a proper Event. The hills behind our house were enshrouded with mist, as sombre as the grey sky, and the rain tumbled down for most of the day. In town people were jubilant, exclaiming about the wet weather to complete strangers, stepping happily around puddles and enjoying using an umbrella for the first time in ages. There was a perceptible feeling of positivity in the air. It's always like that when there's a good fall. By the afternoon the clouds were clearing, the last tendrils of mist were creeping up the hills and the sun was making an effort to break through. Remnant raindrops clinging to leaves were glittering jewel-like in watery beams. I won’t have to worry about watering the garden now for some time as the weather isn't hot enough to dry it out the way it does in the Summer. Previous Post Six on Saturday, June 16. I’m sorry you didn’t receive more Tracy, I thought it was moving down your way. Lovely Jane, it certainly made everything look refreshed! Great to receive a decent amount, Marg. Yes, indeed. Long awaited, Derrick. 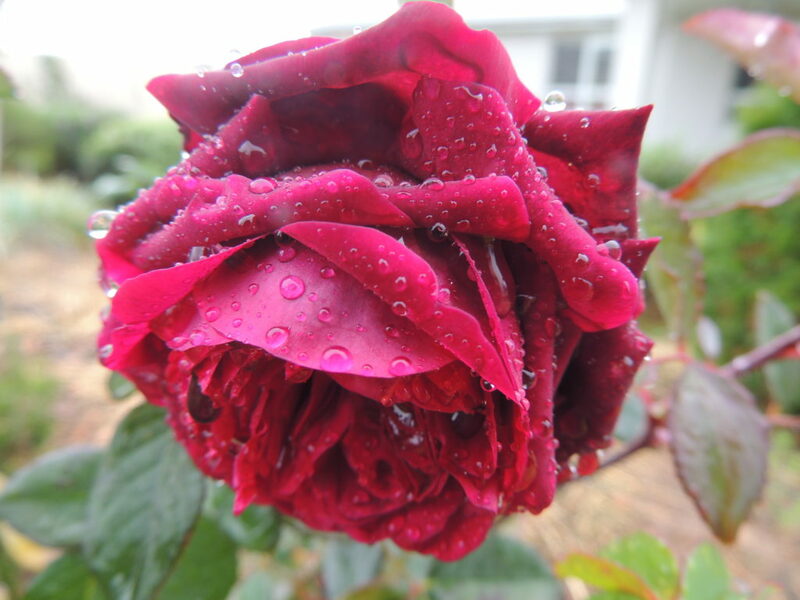 Beautiful photo of the rose, Jane. And wasn’t it a lovely day! I couldn’t stop looking out at the rain! It’s a wonderful relief after a long summer! Indeed, it was lovely to see. We never complain about rain, no matter where we are, Pauline! We got lovely rain too, the first since November. I love how everything is washed and looks so fresh and clean now. First since November? That’s even longer than we had to wait! That rose image is gorgeous with the water droplets on it. We’ve got a few dry days down in Melbourne, but today, when I caught a taxi over to my doctor at around 1.00pm the sky was very overcast and deep mist/fog was still hanging around. It was the coldest June day in about 25 years. I heard about your cold day, Vicki. Glad you like the rose: it’s hanging on despite the wintry weather. Hooray! That must be so wonderful after such a long, dry spell. Enjoy the rest from watering, Jane . . . and also the beauties in your garden (that rose photo is quite lovely). Thanks Lis. I had a relaxing day watching the rain! Jane , Well put , I share the feelings of your community . It’s amazing how the rain lifts the spirits, Jean. They certainly are, Jude. Most of the roses have finished for the winter, but that one was hanging on. That’s the best kind of rain. We experience the same kind of jubilation when we get it here. I hope this event is just the start of a long series of gentle soaks during your winter season. Oh that sounds wonderful Jane. I used to take rain for granted but even for us, not this year. Our clay soil has baked rock hard. Even the weeds are dying! And it’s so hard to get the weeds out when the ground is like that, too. Hope you receive some rain soon, Jessica. It is always so nice to get some decent rain and to not have to worry about watering the garden for a while. 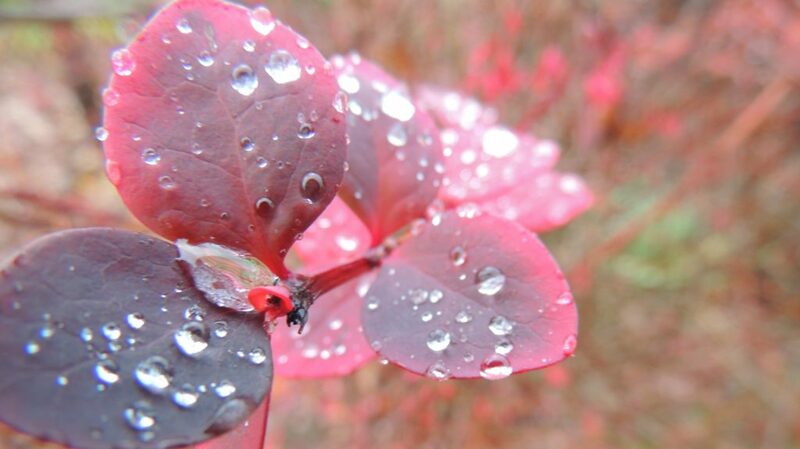 The leaves and rose in your pictures look so pretty with the glistening raindrops. Its a reprieve, certainly, Kristah. Thanks for the comment. So glad you got some rain, Jane! Now we would quite like some! Seems funny, you wishing for rain after the spring you had, but I know how quickly things can change. What lovely rain soaked roses! Thanks Cathy. The rain was the loveliest part!